Being 95 degrees outside in Alabama, I was trying to think up something to cook for the wife. The heat must have gotten the better of me because I decided hot soup would be perfect. I went scouring the internet for recipes and finally came upon a recipe by the great Alton Brown on the Food Network site here. I whipped it up (making a few adjustments based on comments on the site), and I must say it turned out fantastic (be even better if the mercury was at least below 60 degrees Fahrenheit). Below is the final recipe that I used. This was my first experience with leeks, and I was pleased to find the following short video on how to clean and prepare leeks for cooking. Once hot, add the leeks, garlic, and a pinch of salt and sweat until they begin to soften, approximately 7 to 8 minutes. Add the carrots, potatoes, and snap beans and continue to cook for 4 to 5 more minutes, stirring occasionally. Add the chicken broth, increase the heat to high, and bring to a simmer. Once simmering, add the tomatoes, corn, zucchini, northern beans, and pepper. Reduce the heat to low, cover, and cook until the vegetables are fork tender, approximately 35 to 40 minutes (the snap beans took quite a while to soften up). What a tasty soup recipe. WAF was high, so this soup will be added to my basket of recipes. 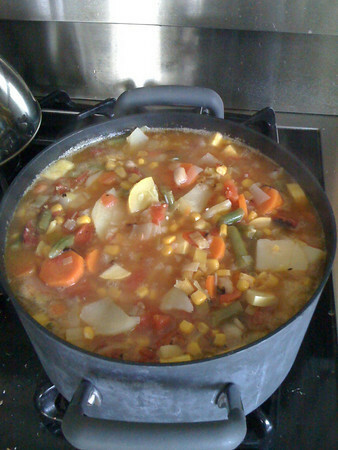 This entry was posted in Recipe and tagged Recipe, soup, vegetable soup, waf. Bookmark the permalink.